Following a successful landing during the early hours of Sunday Morning, the NASA Space Probe ‘Spirit’ has already sent back many pictures of the Martian landscape, and has spent many hours roaming the terrain. One of the first photographs the NASA probe ‘Spirit’ sent back to Earth was this photograph of a giant UFO crashed into a mountain. 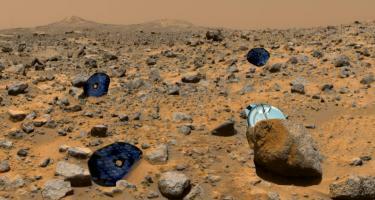 NASA's Rover Probe Sent Back Photographs showing that the Beagle 2 probe crash-landed on Mars. 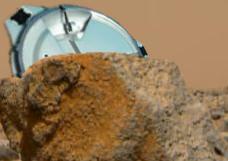 Observers were quick to point out that Martians would probably not copy the Beagle 2 design of probe to search for life on Mars, as with Mars being their home planet their own existence would be proof enough that there was life on Mars.